In prehistoric times, Black Hole was a spring or sinkhole, but the circular opening is now 65 feet below the Gulf of Mexico’s surface. The entrance to this large drowned sinkhole is close to 100 feet in diameter. From the rim, the limestone shaft plunges to depths of 224 feet, taking on an hour glass shape at 100 feet. 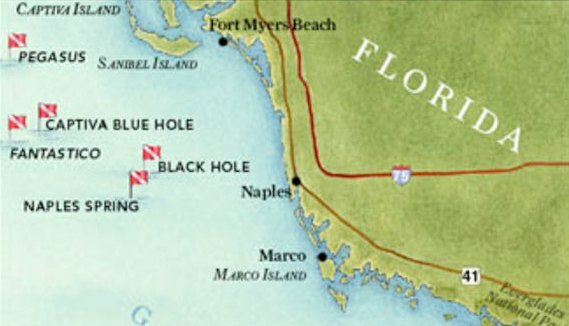 Also known as Naples Spring, “The Hole” is an offshore sinkhole located approximately 27 miles off the coast of Naples. Narrowing at about 100 feet and then opening up again, this site offers caverns, ledges and outcrops. This is a favorite spot for underwater photographers because the rim of the sinkhole is teaming with marine life, including a variety of brightly colored corals, sponges, and sea anemones. This also is a popular spot where sea turtles frequent along with large grouper and many other kinds of fish. Several sponge-covered ledges can be found near the entrance. Although the opening and outer rim of the Black Hole is accessible to intermediate divers, only advanced cave divers with the proper equipment should attempt to breach the caverns. Some liveaboard charters stop at this site. Visibility fluctuates between 10 and 50 feet.